Sometimes, the best ideas are born out of desperation and necessity. And if you are or ever have been a breastfeeding mom, you will instantly understand how a particularly clever way of using Smucker’s Uncrustables was discovered in one such moment of desperation. The idea comes from breastfeeding mom (and lifesaver) Jayde Donovan, who posted about her “#boobhack” on Twitter. 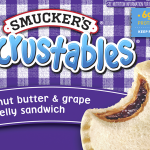 Donovan noted that if you freeze Smucker’s Uncrustables — yes, the crustless peanut butter and jelly sandwiches that can be easily tossed into a kid’s lunchbox — and insert them into your nursing bra, they help soothe sore and tender breasts. And once they thaw out, they also make for a nice snack! Genius! It’s always great when moms feel they can be candid about the joys — and also not so joyous parts — of motherhood, because some of the things moms endure just aren’t talked about enough. Similarly, it was refreshing to see photographer Angela Burzo dispel the idea that breastfeeding comes naturally, easily and pain-free. She posted a photo of herself breastfeeding while simultaneously sobbing. “I love seeing all of these beautiful women in their beautiful nursing clothes smiling down at their babes as they lovingly look back at them hand in hand while breastfeeding away. That is not my reality,” she wrote. Considering the post garnered thousands of likes and comments — it was clear that many could relate. Props to all the mamas out there who keep it real — and who offer tips for everyone else along the way! Will you be giving the PB&J breastfeeding hack a try?